It’s six o’clock in the evening, Saw Ku Do reviews his English lessons shortly after finishing an 11-hour shift serving food and sweeping the floor at the tea shop where he works. “Dog, cat, pig,” he said while looking at his notebook. Saw Ku Do, age 15, only has a second grade education. He dropped out of school to go to work to help support his family. He says his parents are day laborers and struggle to take care of their six children. 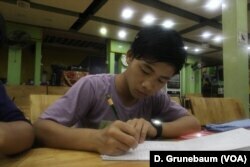 Saw Ku Do reviewing his English notes. Saw Ku Do says he gets one day off every other week and makes the equivalent of about 60 U.S. dollars per month. He sends most of that money home to his parents who live in a village about eight hours away from Yangon, Myanmar’s commercial capital. His story is a common one across Myanmar, also known as Burma, where more than a quarter of the population is impoverished. One out of five children ages 10 to 17 goes to work instead of school to help support their families. Many of them move away from small villages to work in tea shops in Myanmar’s cities. At night they often sleep on top of tables in their tea shops or on a piece of cardboard that’s spread out on the floor. Myanmar has laws prohibiting children under the age of 14 from working and until 16, they’re not allowed to work more than four-hours per day. However, enforcement is lax. But while these kids often left the classroom years ago, there’s a program that’s bringing class to some of them. 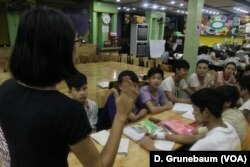 Han Zin Tun teaches English to teashop workers at night. It’s the Myanmar Mobile Education Project also known as myME. The program teaches subjects including math and English plus vocational training in fields such as hospitality and tailoring. 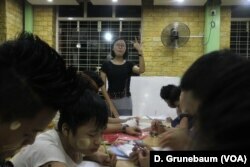 Three nights a week, Saw Ku Do’s tea shop is converted into a makeshift classroom. “I hope to improve my education so I can have a better job,” he said. The goal of myME is to help these tea shop workers get an education and skills so they’re not stuck in these low paying jobs for the rest of their lives. MyME trained Naw Aye Aye Naing, 20, to be a tailor. She now works at a boutique clothing store earning double what some tea shop workers make. “MyME improved my life a lot,” she said. The program’s executive director, Tim Aye-Hardy, is a Myanmar native who moved to the United States in 1989. This Yangon teashop is converted into a makeshift classroom three nights a week. Myanmar’s economy and education system were crippled during nearly 50 years of military rule. The country has been undergoing political and economic changes during the past several years. MyME’s annual $200,000 budget comes from private donations. The program teaches about 500 workers at 35 tea shops across Myanmar. But that’s just a small fraction of the more than one-million child workers in this country. “If we don’t help them they’ll never be able to climb out of this trap and then they might be so poor that their kids will also have to quit school to work just like they did,” Aye-Hardy said. In Saw Ku Do’s English class, his teacher asks him what his favorite animal is. “It is a cat,” he replies. Saw Ku Do dreams of owning his own business when he’s older. He says he and his coworkers feel lucky to be part of myME.